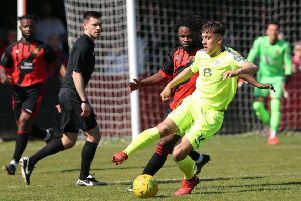 Lee Bradbury has raided Bognor for the second time this summer by signing young striker Alfie Rutherford. Rutherford joins Rocks’ top scorer last season, Jason Prior, in making the move to Westleigh Park. ‘There were a number of clubs chasing Alfie Rutherford and offering him more,’ said Bradbury. ‘It is quite refreshing that he has chosen to join us and take up the challenge playing for his local club. ‘He scored 22 goals in something like 32 appearances last season. Rutherford’s signing comes just 24 hours after Bradbury captured ex-Pompey player Bradley Tarbuck.